The 100 µm scale bar applies to figs. 1-5, 6b, and 7-10. Figs. 6a, 11a and 11b have their own scale bars. Fig. 1-9. Spongurus cylindricus, including fully developed forms with veil and detail of internal layering of a spine in 6a. 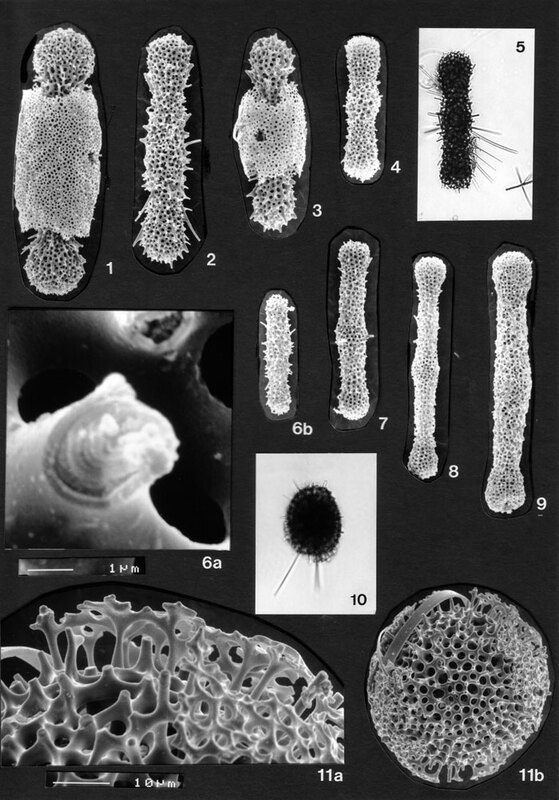 Note difference in relative pore size between the thick specimens in the top row and the more slender ones in the lower row, and the absence of microperforate sheaths in the lower row. All BSS; 28B(III/68, 73, 65, 71); 5OB(F) EF V28; 28B(III/66, 74, 74, 67). Figs. 10, 11a,b. Spongurus ellipticus. IOW 188(F) and BSS 28B(VIII/988).